The Secretary General of ECO H.E. 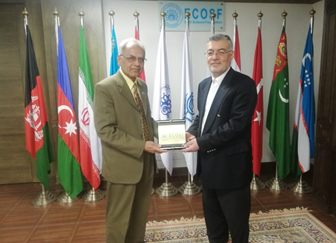 Dr. Hadi Soleimanpour paid a maiden visit to the Secretariat of ECO Science Foundation (ECOSF) on 15 March 2019. He was cordially welcomed by the President ECOSF Prof. Manzoor H. Soomro. The Secretary General was on his three day (13-15 March 2019) visit to Pakistan. Director (ECO) of Ministry of Foreign Affairs of Pakistan Ms. Naila Israr also accompanied him. President ECOSF briefed the Secretary General of ECO about the emergence and development of the Foundation since 2011. He shared the core initiatives of the Foundation for the promotion and implementation of Science, Technology and Innovation (STI) in the ECO region. Prof. Soomro also apprised the Secretary General about the challenges faced by the Foundation. The two leaders agreed to hold the next meeting of the ECOSF Board of Trustees as soon as possible. H.E. 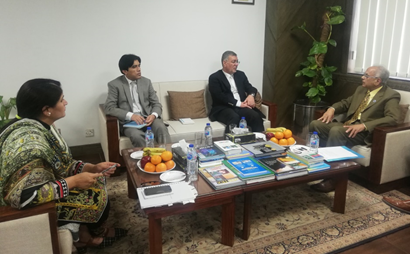 Dr. Hadi Soleimanpour expressed the great pleasure in visiting ECOSF- an important specialized agency of ECO based in Islamabad; and said that the specialized agencies/institutes of the ECO are the strength of the ECO. He also said that ECO region has been a peaceful region unlike other regions of the world who have big rivalries and fighting with each other. ECO region is also rich in natural resources and all the Member Countries can benefit from each other’s specialized fields and for this purpose ECOSF can help for scientific collaboration. The Secretary General assured full support of ECO Secretariat for the Foundation to pursue its goals. During the stay in Pakistan, the Secretary General had met with the Prime Minister of Pakistan, the President of the Islamic Republic, the Ministers of Foreign Affairs, Planning and Finance about the ECO’s initiatives and activities as well as his reform agenda to revitalise the ECO as a regional economic organisation. At the end of his visit, President ECOSF presented Insignia of ECOSF to H.E. Dr. Hadi Soleimanpour.